The south east of Sicily not only includes the UNESCO World Heritage sites of Syracuse and the lovely Baroque towns of the Val di Noto, you’ll also find some of the best coastline on the island here. On the south coast in particular you’ll find long stretches of deserted sandy beaches. 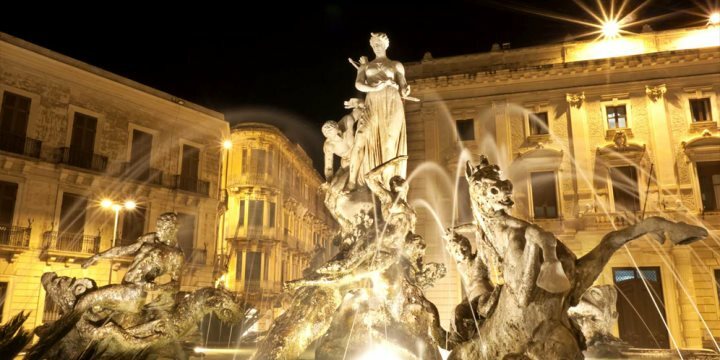 Syracuse, is the best known town of the region and it can be roughly divided into three parts: the modern town with its seaside promenades and broad avenues; the ancient Greek and Roman city at the foot of Monti Iblei; and, lastly, the island of Ortigia with its narrow streets, baroque churches and piazzas. Of particular note is the remarkable Piazza del Duomo: a masterpiece of baroque architecture lined with restaurants and home to a stunning cathedral adapted by the Byzantines and later the Normans from a 5th century BC temple to Minerva. The Catacombe di San Giovanni on the outskirts of Syracuse features ancient Rome and its history. This is worth a visit and you can tour around with or without the tour guides as you prefer. Ortigia island is linked with two bridges to Syracuse town, and is the perfect place to explore without your car as you can park in the Talete car park (pay and display). Just 5 minutes walk from the car park are the remains of the Apollo Temple, and heading to Piazza Duomo you pass through Piazza Archimedes - named after the mathematician born in Syracuse in 3rd century AC. There are many restaurants serving traditional Sicilian dishes. There is also a plethora of bars where you can sit and have a glass of local wine with some arancino. Caravaggio's 'Burial of St Lucy' painting is in Santa Lucia church in Piazza Duomo, and is also worth a visit. During the devastating earthquake of 1693 much of the south east region of Sicily was destroyed. 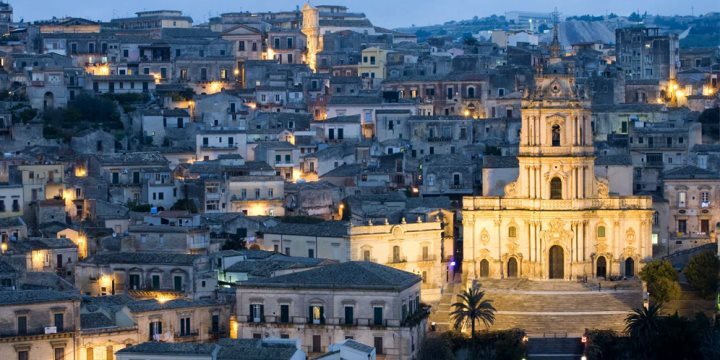 Towns were re-built from scratch, sometimes in new locations, and redesigned according to Renaissance and baroque town planning - including, most notably, the charming towns of Noto, Modica and Ragusa. Yet few tourists find their way south of Noto, which is on the same latitude as northern Tunisia. Age old twisted olive trees grow in the fields here and deep ravines shelter prehistoric tombs. As well as fascinating ancient sites and fabulous beaches, the south east of the island is also a food lover’s delight. Ragusa is particularly famed for its gastronomy and produces some excellent cheeses while nearby Modica is known for its Cioccolato al peperoncino (chilli chocolate) and there are several chocolate shops and factories. Noto is known for its delicious ice creams - the gelateria ‘Corrado costanza’ is amazing, considered by some the best ice cream around. It also does pastries/cannoli as well which are widely known to be excellent too. It's located off the main tourist street - which is nice because it’s quieter and worth finding. 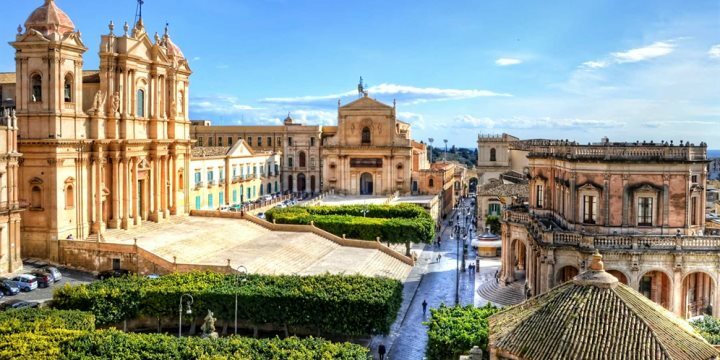 In Modica there are two churches which are worth a visit: San Pietro, in the centre of Modica along the main street; and San Giorgio, in Modica Alta. The latter is a decent walk out of the town centre, however you are rewarded with beautiful views if you can make it up 'the grand staircase'. In Noto the little theatre on the main street is beautiful - it’s really tiny but you can explore everywhere, and even go on the stage if you like. Pozzallo is a nice seaside town with bars and restaurants along its seafront. Just out of the town along the coastal road towards Noto there are secluded, unspoilt beaches and coves that will be less crowded than in town. Marzamemi is lively with the locals in the summer evenings. Many bars and restaurants offer music until late - if you want to experience an authentic Sicilian/Italian night out..! The main square also has a lovely little church and hosts several weddings during the summer months, which are fascinating to see with their stunning dresses. There are also several concerts and shows held in the square on the summer evenings.